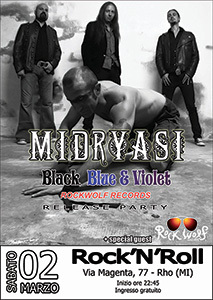 The recording debut of RockWolf Records is the third album of the Italian band Midryasi: BLACK, BLUE & VIOLET. The forthcoming album is going to be released on February 15, 2013 and in order to celebrate the band’s 10th anniversary and the label’s debut, RockWolf Records will publish the album on splattered vinyl, 180 gr., 300 numbered copies. The band, active since year 2002, makes its comeback on the recording market with this new full-length album and keeps making a heavy sound inspired by doom and psychedelic rock, using improvisation as primary source of inspiration. 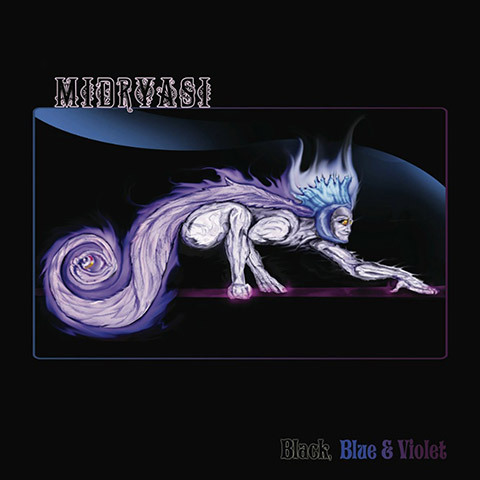 For fans of Black Sabbath, Hawkwind, Celtic Frost, Pentagram …Progressive Rock. One of the most surprising features of Midryasi is their being similar to all these bands and at the same time having the talent to be like no one else, being able to mix doom, extreme and psychedelic influences without losing coherence and uniqueness. Enter the code you will find inside the Lp. After almost 40 years spent listening to music, today Wolf starts his new label, RockWolf Records, for those who love Stoner, Doom, Psychedelia and Rock in general.